If the SNP wants to advance a democratic and independent Scotland, it must do more than act as the dominant party. Flickr/Jonathan Riddell.Some rights reserved.After eight years of defying the laws of political gravity, the normal rules of politics are back. 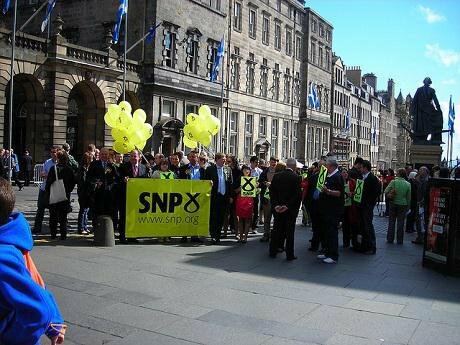 The SNP are, like everyone else, mortal. Michelle Thomson, newly elected SNP MP for Edinburgh West, has built a £1.7m property portfolio with her husband through buying properties at knock down prices from vulnerable people. Her solicitor, Christopher Hales, who undertook the conveyancing work on 13 properties was struck off last year by the Scottish Solicitors’ Discipline Tribunal. Whatever the legality of these purchases, the ethics and morality aren’t good. This is self-interested, self-aggrandising behaviour ‘preying’ on the needy and weak. Embarrassingly, Thomson was head of pro-independence SNP-front Business for Scotland, and seen as a SNP high-flyer in the referendum. Numerous SNP senior figures praised her, from John Swinney to Fiona Hyslop, with even Jim Sillars lauding her ‘commitment to social justice’. Then there is the issue of T in the Park which the Scottish government gave £150,000 to when it moved from Kinross-shire to Strathallan. The logic for this was fear that it might move out of Scotland. This from a festival synonymous with being in Scotland, and a company, DF Concerts, which has consistently in recent years made over £4.5 million pre-tax profits per year. All this was facilitated by Jennifer Dempsie, lobbying for DF Concerts, but who happens to be an ex-Alex Salmond advisor who worked for the SNP and Yes Scotland, as well as partner of Angus Robertson MP - leader of the SNP Westminster group. Many Nationalists show a blind side to these allegations. They are only allegations of wrong-doing they say, and it is all part of a unionist and media conspiracy. This misses the point. First, Scotland has just come out of the experience of one party rule – the Labour one. Many of us spent years detailing and chronicling the cronyism and shoddy deals of the politics it became reduced to. Now the SNP is the rising force in the land. Its dominance isn’t quite yet at the proportions of Labour’s inter-generational, incestuous politics, but it isn’t looking great after eight years in office. Some of us don’t want to pass seamlessly from one version of one-party dominance to another. The SNP need to know the pitfalls that come with majority power, one being that you cannot continually present yourself as an insurgent, and that there is a need for proper opposition and scrutiny. Second, this matters in relation to independence. Many Nats sweep aside these allegations with words to the effect of, ‘keep your eyes on the prize, it will all be different after independence’. This is disingenuous. For a start, the SNP and independence have become more, not less, synonymous since the referendum. The former taking hits affects the prospect of the latter. There is also the practical issue that the SNP cannot win a future referendum just on true believers or nationalists. They need voters from other parties and persuasions. As importantly, it doesn’t paint a very attractive, democratic picture of an independent Scotland – one with a dominant party doing what its likes to keep itself in power and reward its supporters. Third, one of the common themes of the Thomson and T in the Park sagas is the characteristics of some of the SNP new class who have emerged in recent years as the party has become ascendant. These are the type of people who operate around power, access and doing deals – and it is often not an attractive politics. Maybe, just maybe, Peak SNP has happened too soon in terms of next year’s elections. Their 62% support came nine months before Scotland goes to the polls and there is only one way from such stratospheric ratings – and that is down. The SNP have also shown themselves as rather poor at managing high expectations – the 2012 local and 2014 European elections being good examples. Eventually the difference between that SNP 62% and 35% satisfaction at their government record will become a live issue. The aim of Nicola Sturgeon as leader in this environment has been, for all the ‘Red Nicola’ hype, similar to taking a fragile, precious vase from one side of a room to another, across a slippery floor. The vase in question is the SNP’s impressive popular support, while the other side of the room is Scotland post-2016 and winning a second consecutive majority. This raises the thorny question of power for what and ultimately independence for what? ‘Nationalism alone is not enough’ says one of the main characters in John McGrath’s celebrated play The Cheviot, the Stag and the Black, Black Oil. The consistent trope of recent years has been that independence allows Scotland to take decisions itself and do them better in the name of advancing a more centre-left, social democratic Scotland. What we need to ask after the events of this week is, for the Michelle Thomsons and others, whether all independence is about is more power and more opportunities for self-interest for some? We now have to seriously ask this question, and for the SNP’s and the cause of independence’s sake, had better get some serious answers.